Liquid Force Wakeboard - Peak 2017 - Flex Track, 3 Stage Rocker, Park, Mid Flex. Liquid Force Peak Wakeboard 2017. If you're wanting a different feel compared to other high end park boards then the Liquid Force Peak is a board for your consideration. Built with a full wood core to give a more spring loaded flex with rebound. 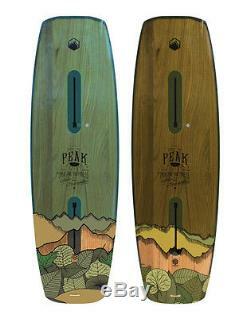 If youre looking for a board that is ready to bounce off the water, the Peak is the board for you. The unique single concave hull shape, mid body channels, and a concave beveled edge allows this board to be ridden finless and still hold a solid edge. With the Liquid Force exclusive liquid rails and grind base, this board can take a beating on any feature. Adding to the already impressive flex pattern of this board, the FlexTrack system will have you more connected and in control than ever before. You wont need to Imagine Happiness, you will Experience Happiness. Length - 52.4 / 133.0cm. Width - 16.4 / 41.7cm. Rocker - 2.4 / 6.2cm. Stance Range - 20.5" - 24.5" / 52.1 - 62.2cm. Rider Weight - 70 - 140lbs / 32 - 64kg. Length - 54.0 / 137.0cm. Width - 16.8 / 42.5cm. Rocker - 2.6 / 6.6cm. Stance Range - 21.5" - 25.5" / 54.6 - 64.8cm. Rider Weight - 90 - 170lbs / 40 - 77kg. Length - 55.6 / 141.0cm. Width - 17.0 / 43.4cm. Rocker - 2.7 / 6.9cm. Stance Range - 22.5" - 26.5" / 57.2 - 67.3cm. Rider Weight - 130 - 200lbs / 60 - 91kg. Length - 57.1 / 145.0cm. Width - 17.1 / 43.5cm. Rocker - 2.8 / 7.0cm. Stance Range - 23" - 27" / 58.4 - 68.6cm. Rider Weight - 160 - 230lbs / 72 - 105kg. Order before 3pm for Same Day Dispatch. This product has no reviews yet, however see what our buyers say about our other products..
How to return a product. In all circumstances, you will be responsible for the item or items until they reach us. The everchanging opportunities that come our way mean that where something may not be available one week, it is the next, so please keep in touch. Every week and most days we load new products. The idea came out of another successful business we created called Urban Surfer based in Exeter, Devon; Urban Surfer was well known and respected, not just locally but across the UK and Europe. With this comes over 20 years experience in the Snow and Surf industry as well as years of being boarders ourselves. This means we have a stack load of contacts to get the best deals for you. Treating customers, as we would like to be treated ourselves is one of key beliefs and the foundation of our customer service. If you live in Exeter, or the South West of England please feel free to come and visit the warehouse to see/try our Snowboards, Snowboard Boots, Snowboard Bindings, Ski Snowboard Goggles, Ski Snowboard Gloves, Skate Shoes, Dakine luggage and backpacks, Sanuks or any of our other products. You may also be interested in.. The item "Liquid Force Wakeboard Peak 2017 Flex Track, 3 Stage Rocker, Park, Mid Flex" is in sale since Wednesday, May 10, 2017. This item is in the category "Sporting Goods\Waterskiing & Wakeboarding\Wakeboards & Kneeboards".